Hostacam offers Live Streaming Doggie Daycare Webcams PUBLIC or PRIVATE! Hostacam makes installing Live Streaming webcams in your Dog Daycare easy and secure. 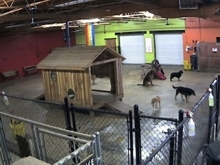 Hostacam uses an IP Webcam system to stream the Doggie Daycare webcams. The Live Streaming webcams plug directly into your current network router. No computer or extra equipment is needed. We have also developed an Online Webcam/User Management System that allows you, the Business Owner, to be in control of assigning your parents their own user names and passwords to view the webcams, as well as setting times for viewing the webcams. This is good for home daycare's, that would like their webcams to go offline after they close. Allow your parents to view their dog(s) from any computer. Hostacam servers keeps your Doggie Daycare webcams secure. Doggie Daycare owner is in control of User Management System and assigns their own users names and passwords for their customers. Webcam cost includes custom webpage and technical support. Webcams used are IP webcams and plug directly into your current router. No computer needed to stream the webcams. You must have a High-Speed Internet connection (Cable, DSL or T1) at the location you are streaming the webcams. You will want a fast upload speed for the best streaming possible. Ask your internet provider for more details. We recommend getting a static IP address. If your IP address changes, it could take down your cameras occasionally. A static IP address is an IP that never changes, you need to contact your Internet provider to request this. There are work arounds, however, we recommend a static IP. It's the only way to be sure they stay online 24/7. We know it can all be a lot to take in, if you have ANY questions, please do not hesitate to contact us. We are here to help. Request a quote or place your order today!! !